Hi crafty friends! I hope you are having a great week and had time to play with some paper today! Heather here to share another project with you using the Hello collection from Doodlebug Designs. After three layouts, I have so much product left for probably another few layouts! 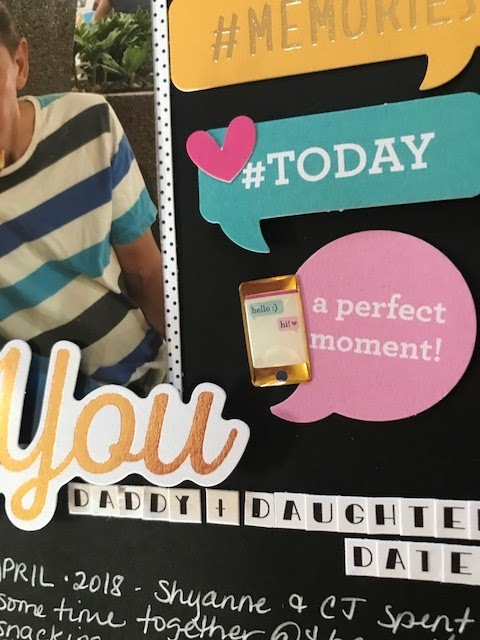 This layout is of my daughter and husband out on a "daddy-daughter date"...so sweet! 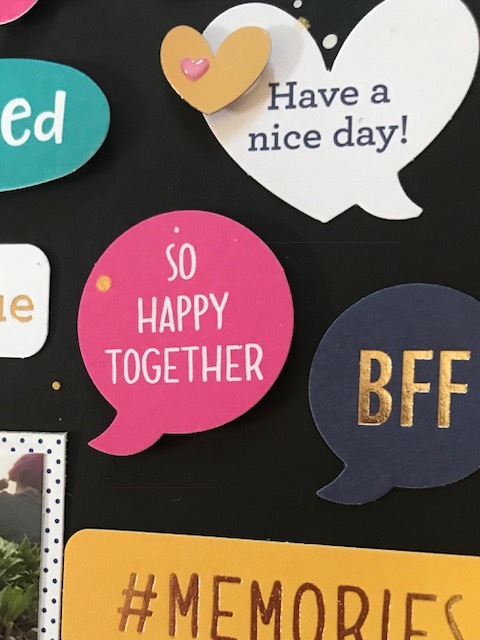 This layout came together so much quicker than normal , but it was easy when I had all of these adorable speech bubbles from the Hello Collection chit chat package. I couldn't narrow down the ones I wanted to use because they all had such cute messages...so I add them all! I started with a 12 x 12 piece of black cardstock and started laying down the speech bubbles I wanted to use...spacing them out like a puzzle. 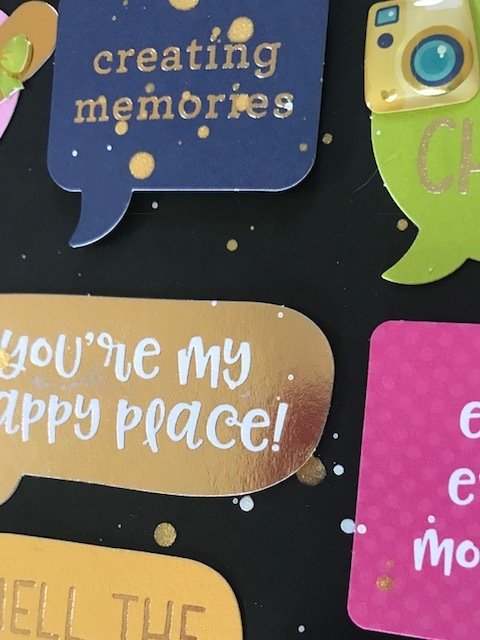 I have been reaching for a lot of black cardstock lately because I love the way the bright colors look against the dark background...Once I had them placed the way I wanted, I glued them down and every other, or just about, I popped up on fun foam. 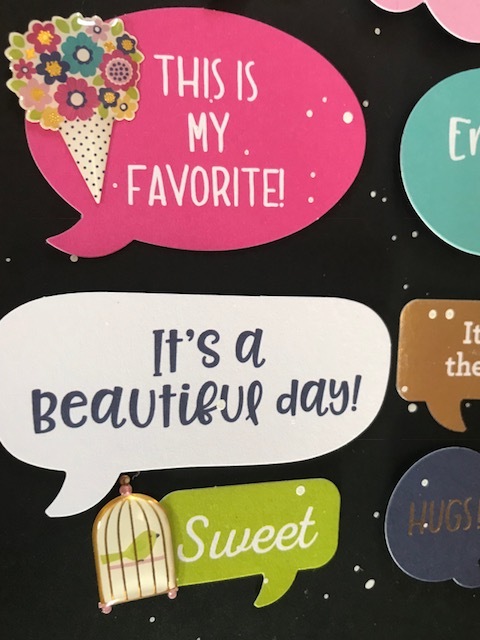 I even added some of the cute little enamel shapes from the Hello shape sprinkles to some of the speech bubbles to add some texture against all of the paper pieces. I layered a few of the matching heart die cuts from the same chit chat package plus the itty bitty enamel hearts from Doodlebug tiny little hearts shapes...I love these....they are too cute! However, because they are so small, I have found using tweezers to place them makes it so much easier! To create my title, I used one of the awesome large phrases from the chit chat package which are perfect for any title...I used the "Me & You" die cut...well because it said it all...and to complete my title, I added tiny alpha stickers from Webster's pages. Lastly, I added some splatters with my Prima Oil pastels for a little bit of messiness and wrote my journaling with a white gel pen. I hope you liked this layout and are inspired to check out the Doodlebug Designs products over at Butterfly Reflections Ink online store! Thanks so much for stopping by!